Hawaii has been on my mind recently. Most likely because it is gray and drab here when the sun is not out to brighten up the leafless landscape. Even on clear days, the sun is a lazy thing, not bothering to get up until 7AM and going to bed early at 4:30 PM. And no snow! Snow makes winter beautiful in the North. But we have only been graced with it once this fall. It wreaked havoc that time because it was too early. The oak trees had not lost their leaves and the heavy snow weighed the branches down so much they broke, falling in a haphazard fashion all over the power lines. We were without power for 10 days. Kind of nice, actually, to live in a more rustic kind of way. But it's nicer to have it back. So Hawaii has been in my thoughts. 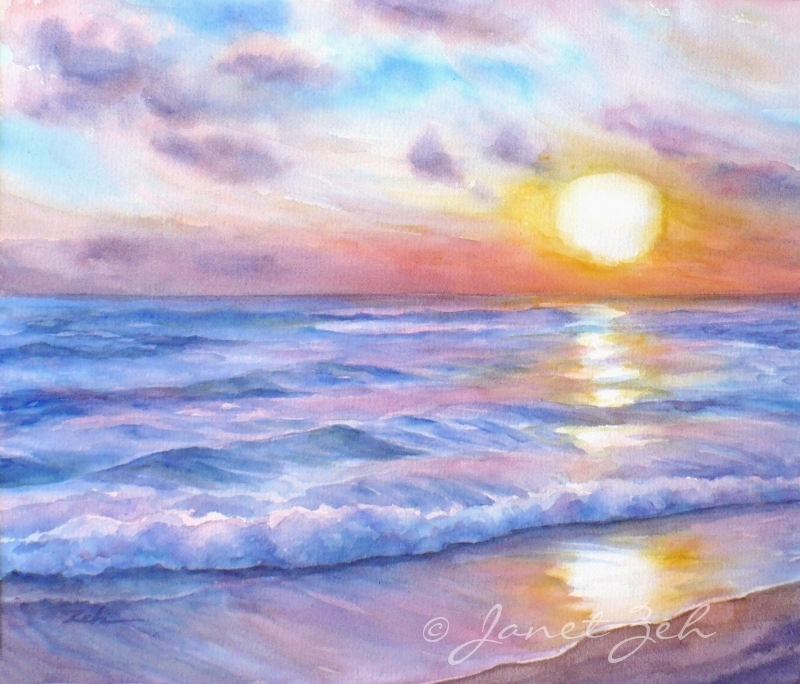 And how lucky that a web surfing lover of sunsets and soft sea colors found my site and wanted a beautiful Hawaii sunset painting for herself. 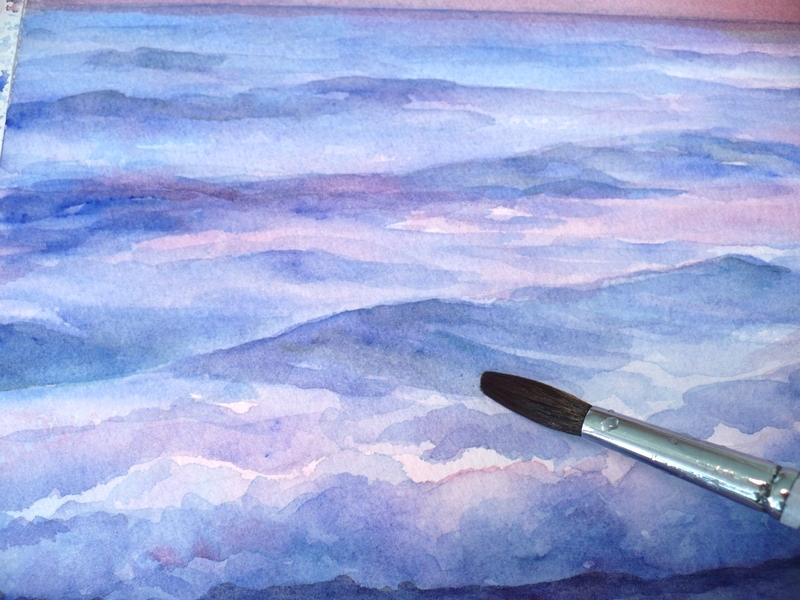 "It doesn't even have to be a seascape," she explained. "I just love the colors in your Sunset Beach paintings. And the big bright sun." Ahh... music to an artist's ears. I can paint whatever I want so long as there is a big bright sun and beautiful colors. 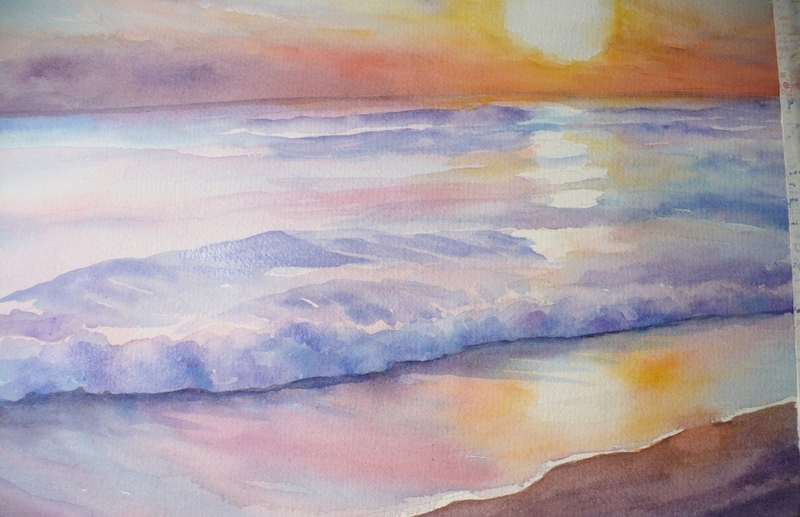 I want to paint a seascape based upon an earlier Hawaii sunset watercolor I did, because where else do you find colors like that? And Hawaii's been on my mind. I begin with the sky colors painting them wet-into-wet and immediately, it's good. The clouds have softened right into the blue of the sky in wispy, cloud-like strands of pale mauve. 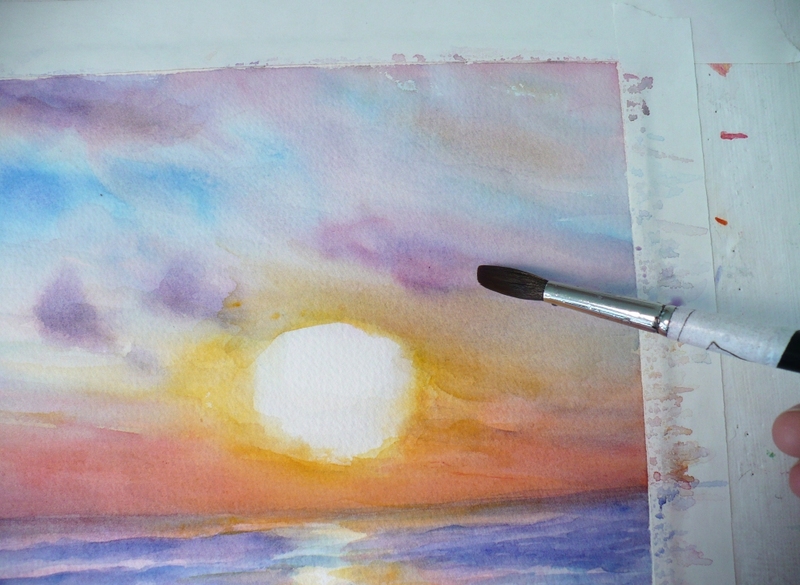 Watercolors are so rewarding when they behave like that. 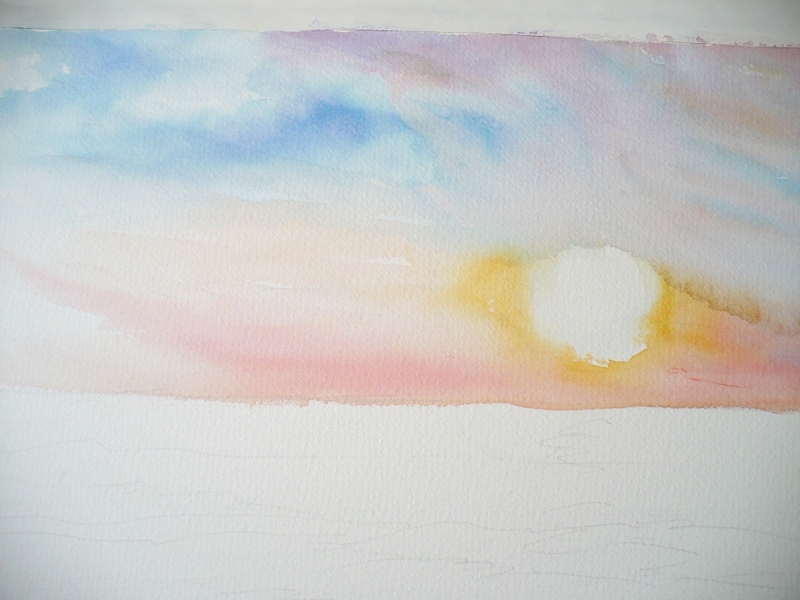 Encouraged by this early success, I add some darker wispy clouds also wet-into-wet and they behave nicely as well. 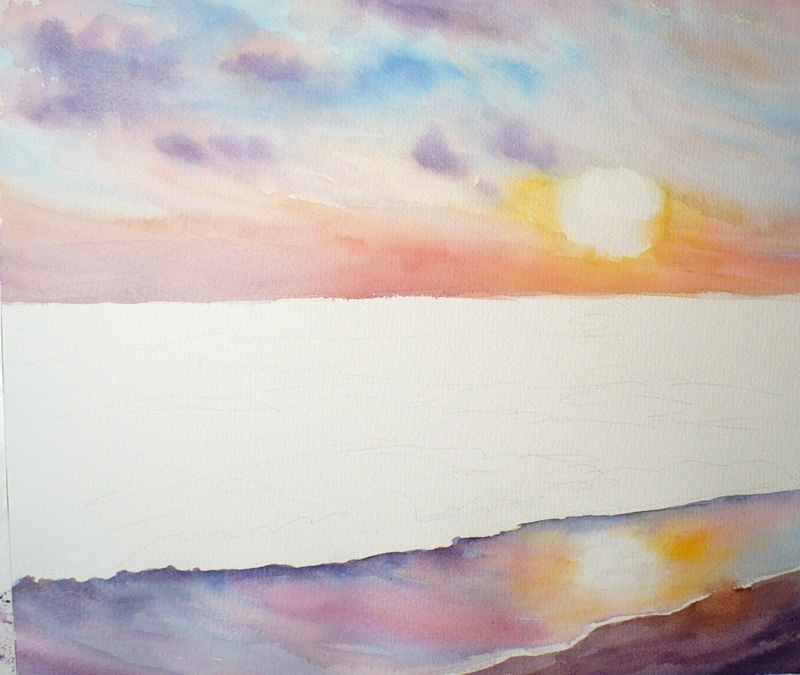 The sunset needs more color, so I wash in more reds and yellows along the horizon. That's good for now, although it will probably need more color later. But things need to dry first. Which means I have to do something with that big white space in the middle. 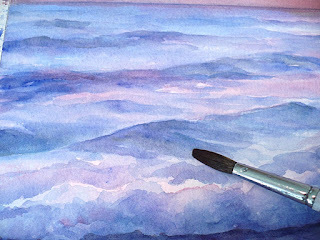 But the ocean is too pale, especially on the left side. Hmmm... I'll let it sit and dry for now and distract myself with numerous other things like planning what color to paint the studio walls since they need an overhaul. 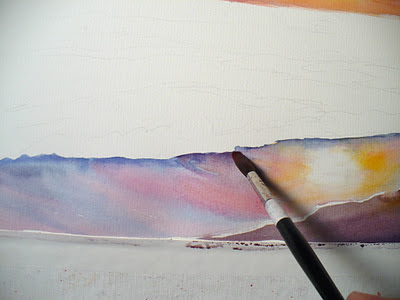 And whether I'll paint the walls in a stucco-like effect or a mottled effect. Or a plain effect. And what about the ceiling? That needs to be painted first. By the time I've distracted myself to the point that the painting is completely dry, I return to it with fresh eyes to see what comes next. The ocean waves are calling to me, "Paint us! We need blue. We need turquoise. We need pale pink reflections. We need waves. So I oblige. They don't know it, but they even need a bit of yellow-green, but just a tiny bit. Funny how that little bit of warm color in a sea of cool colors can make all the difference. Back to the sky which, no surprise, tells me it now needs more work. I add more color to the sunset until it looks right with the rest of the painting. Just to balance things out, I add some purple clouds to the right over the sun. Everyone happy now? 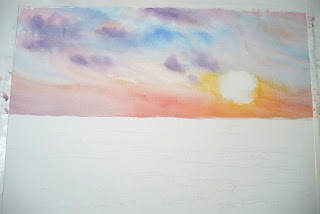 It can be easy to over work a painting, and heaven forbid I do that, so I step back and make sure it is all OK. So off in the mail it will go! Sigh. It was nice to be in Hawaii in December. Wouldn't you like to be there?